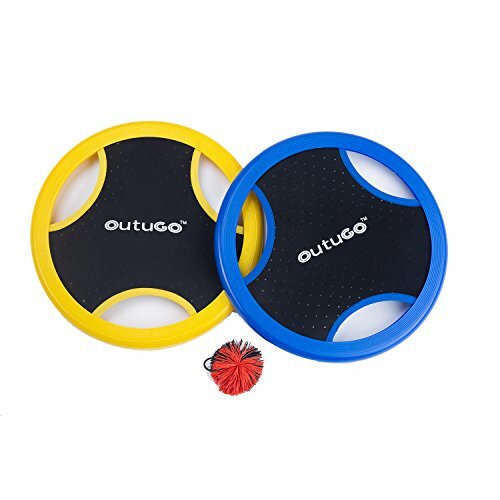 This catch and toss game toy set consists of two heavy duty discs, a string ball. This catch toss toy has multiple handles around the paddle to grip the disc paddle anyway you want. These paddles don't fall apart even if it lies in the water for hours. Children from 3 years up have fun playing it. It is great practice to start learning hand eye coordination with a ball at an early age to help with coordination and focus. This toss and catch game can be played virtually anywhere including the beach, a picnic in the park, your backyard, garden, lawn you name it. Play casually or very extreme, go for diving catches and far throws or invent new ways to play for points.